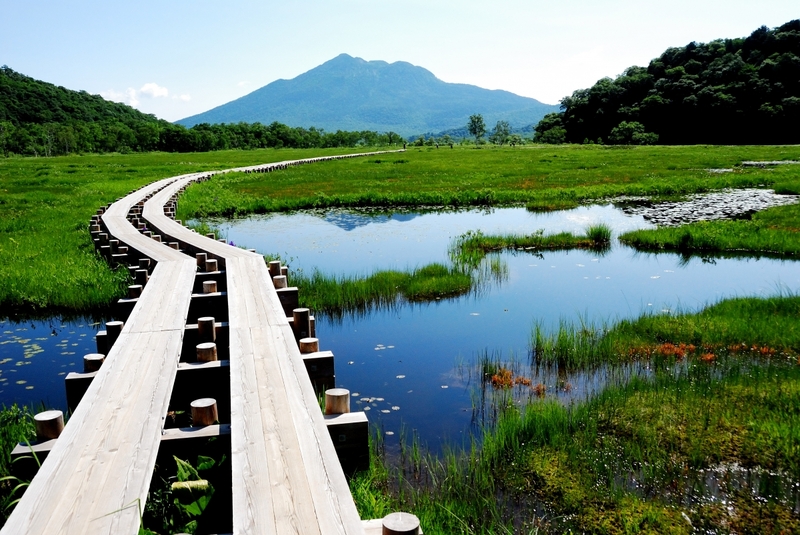 Oze is a part of National park with spreading across Niigata, Gunma and Fukushima, which consists of the Ozegahara moor, the Ozenuma marsh and their surrounding mountains including Mt.Hiuchi and Mt.Shibutsu. 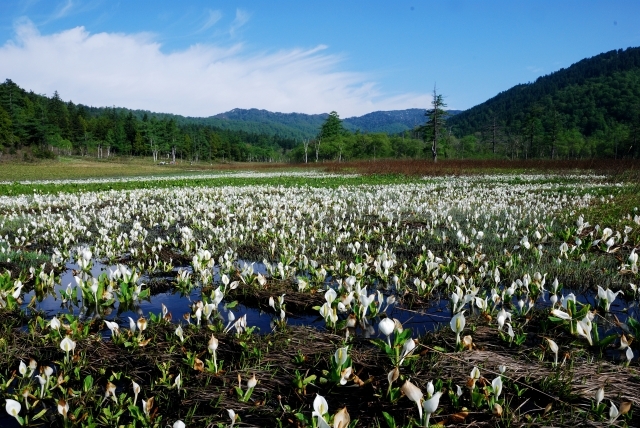 Created by the lava flowing from Mt.Hiuchi which dammed up the Tadami River, it is the largest high moor in Japan set on a basin 1,400 to 1,700 meters above sea level. It is good for hiking destination. Visitors can enjoy varied, beautiful natural landscapes, including vast marshlands, lakes, alpine areas, pristine forests and high waterfalls. The landscape will be changed seasonally from spring to autumn. Because of its height, oze is cooler than other places in Japan. Especially, in summer, you can enjoy its fresh air and feel relaxed by walking in the marshlands. Not only a beautiful place, oze is a place in which many people has been the effort of preservation. In the past Oze faced an environmental crisis caused by the trampling of its marshes by visitors. Now thanks to relentless effort, Oze retrieve its beauty. There is a lot of management by local people about preservation its nature. Generally, it is difficult to walk around because of heavy snow in winter. Popular season is during end of May and beginning of October. When the lingering snow is almost gone, the skunk cabbage season starts in Oze, attracting large numbers of visitors. The white flowers confidently herald the start of Oze’s short open season, and yellow marsh marigolds also open their yellow flowers in support. This is the height of Oze’s floral season. After the white fluff of cotton sedges, the marshes become carpeted with the yellow flowers of daylilies. Visitors are usually delighted with summer in Oze. In September, the trees are still covered with green leaves, but the marsh grass starts to turn orange from its tips. Looking at the marsh against the sun makes the whole area seem to shine like gold. Many visitors take pictures of the golden grass swaying in the wind. Stay at a hotel or a hut? The park can be visited in a day trip from Tokyo, but to avoid a lot of traveling in one day it is also possible to stay overnight in huts.There are four huts or hotels around Oze area. Reservation is required. There are four huts in Oze. Each hut is shattered. Choose your huts according to your trip plan. There are several restrictions for staying huts-,1. Do not using shampoo or soap, 2. Lights go out at 9:00 pm. 3. Dinner starts from 5:00 pm. 4. Check-in time is from 15:00-16:00. Please follow these rules and have fun with huts! From Hatomachi-touge, it takes an hour to walk. It is close to Yamano Hana Goya. Price: Adults: 9,000 yen,Children: 8500 yen (for elementary school students), Infants: 6500 yen (from 3 years old). Dinner and breakfast are included. Reservation is start from 1st February. From Hatomachi-touge, it takes an hour to walk. If you have plan to go to Mt. Shibutsu(至仏山), or you can watch various plant near this hut, called research park (研究見本園). This park has been well paved with 20 min to go round. This hut is located in Ryuguu area. From Hatomachi-touge, it takes 3.3 hours to walk. If you have plan to climb up Hiuchi-dake(燧岳), it is better to stay this hut. Hiuchi-dake is a nice mountain, which is listed on “100 wonderful mountains in Japan”. It takes 7 hours to go and back from Hiuchi-dake. Reservation is required. Please call each telephone number directly. Price: It depends on the number of people in your group, but about 10,000 yen ppl. You can reserve email or online webpage below. Oze is a large place and few marker to guide. Sometimes you get lost owing to its complicated road or bad weather. Please be prepared if you go to Oze. Local guided tour is available in Oze. please book it 20 days prior to your visit. You can book via e-mail or by phone. Price is dependent on the guided route. please check below website. Check local weather information and route. 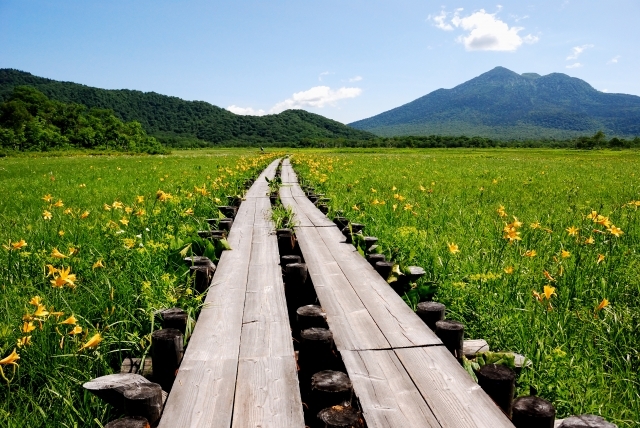 Although Oze is popular place in japan, still difficult to get there. You had better bring with a compass, a headlamp, a map, small snacks and drinks. I have lost in Oze for the first time I went to Oze. Thanks to map and compass, we could finally go back to original route. It is really scary when the sky’s getting dark and there is no sign for showing the place. 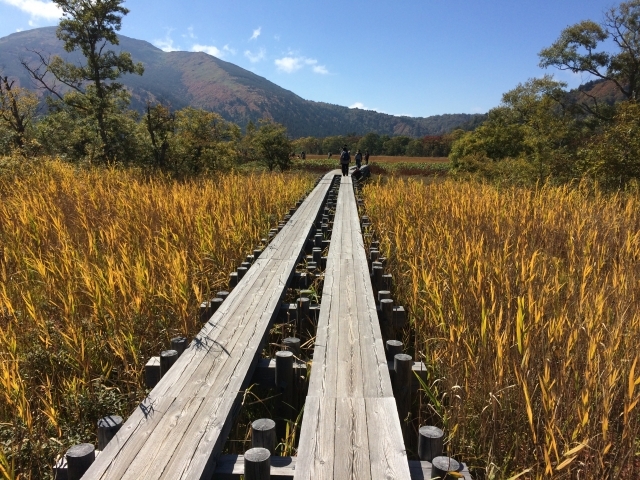 There are three main approaches to Oze National Park: one from the south through Gunma Prefecture and one from the north through Fukushima Prefecture and the other from Niigata Prefecture. For visitors coming from Tokyo, the approach through Gunma Prefecture is convenient and for visitors coming from Tohoku, the approach through Fukushima Prefecture is convenient. There is fewer bus available bound for Oze from this station. Preferred to take Numata station.